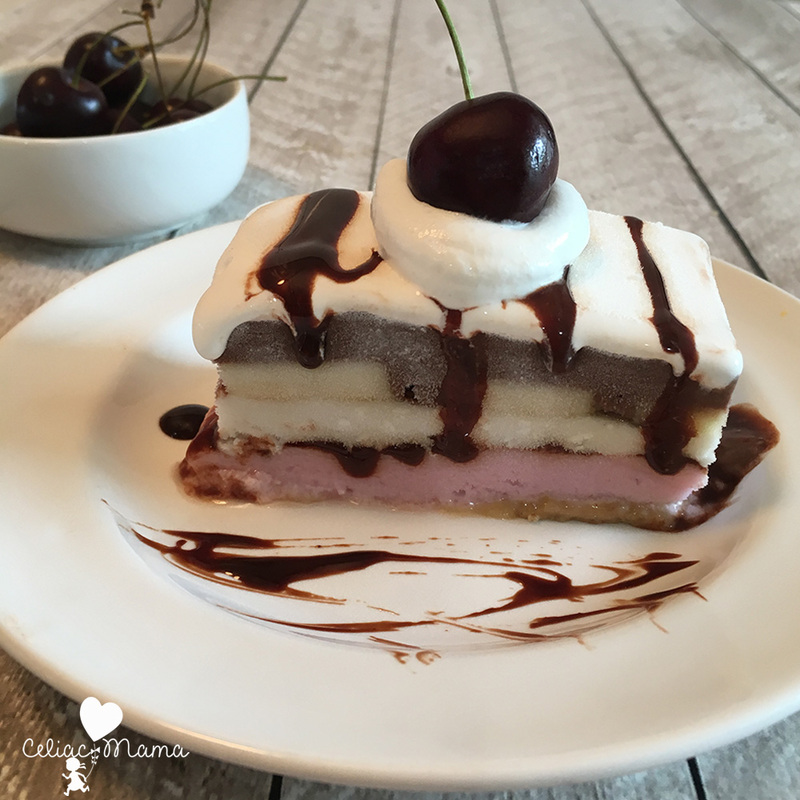 Banana Split Ice Cream Cake makes an amazing dessert for kids and adults alike that puts a dairy free, modern, and healthier spin on a classic dessert. When I was a child I remember banana splits being the ultimate special occasion treat. They had everything in them – the bananas, three kinds of ice cream, chocolate syrup, caramel, whipped cream and don’t forget the cherry on top. Enough to make a kid’s dessert dreams come true! They are an American tradition that dates back to 1904, when David Strickler invented the ice cream sundae in Latrobe, PA. As you can imagine, it’s popularity spread quickly and banana splits are still being enjoyed more than 100 years later! 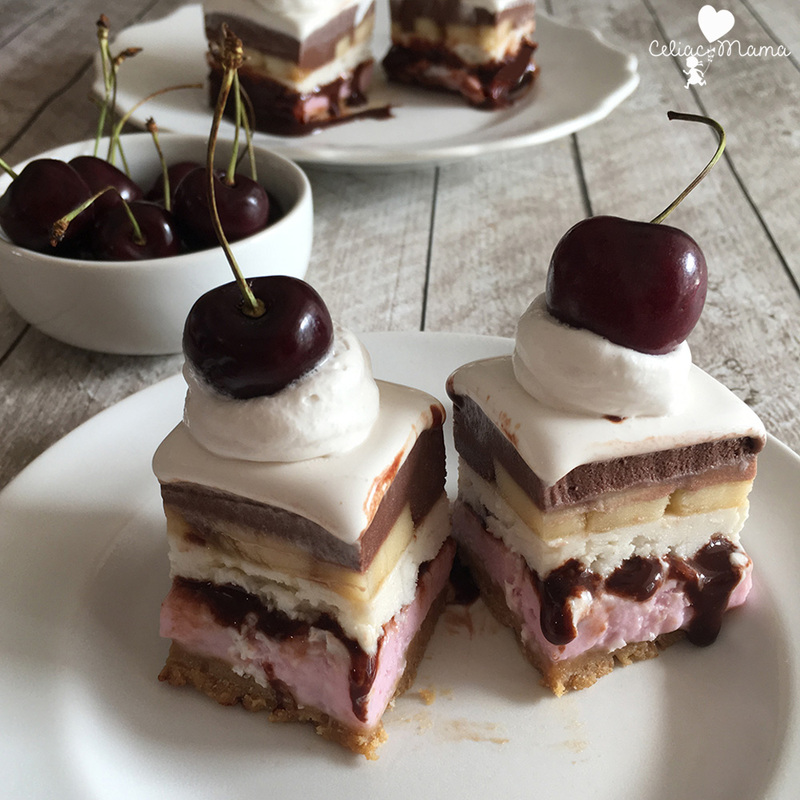 When I heard about the So Delicious Frozen Dessert Contest I decided to do my best to recreate this classic dessert in a gluten free, dairy free plant-based way. Our family eats So Delicious yogurt daily and we love their coconut and cashew milk frozen desserts for special occasions. So, when I heard that they’re holding a contest that involves experimenting in the kitchen to make new delicious treats for my family and that I’d get to use ingredients that I already know taste amazing…well, it was an easy decision. I signed up right away! My children are both gluten free and dairy free, so they’ve never had a traditional banana split. When I started thinking about classic desserts, I thought about how awesome it would be to bring this tradition back for special occasions in an allergy friendly way that the whole family can safely enjoy together. 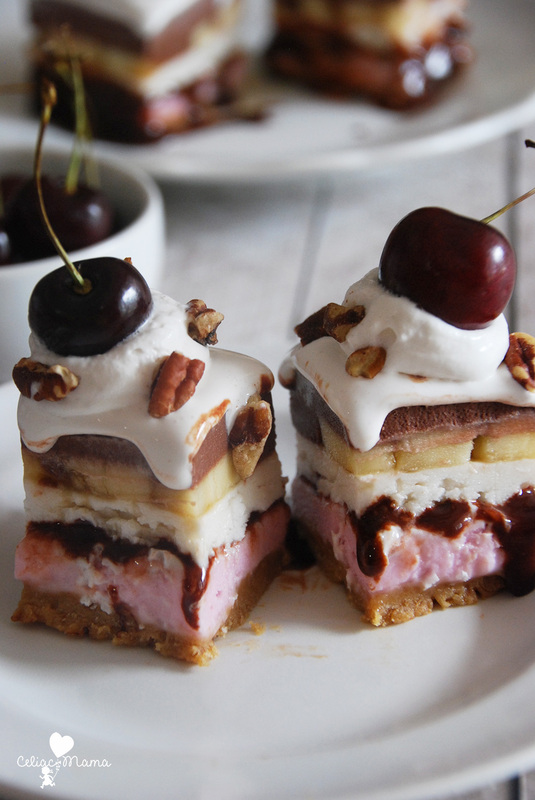 And so my desire to make dairy free banana split ice cream cake was born. If you’ve been following my blog for a while, then you know how I get when I go into “mama mode” and am determined to make something that my kids can enjoy. I get tunnel vision and while it may take me several versions before I come up with a good recipe, I don’t stop until I do. This time was no different. My first try making the dairy free banana split frozen squares involved way too much chocolate fudge. I know you’re probably thinking too much chocolate fudge is impossible, but it spread into the other layers and was too overpowering. So, on my second try I dialed the fudge layer back a bit, giving it the fudge taste and texture it needed to compliment the other flavors. The end result tastes so amazing! The combination of the coconutmilk ice cream flavors with the chocolate fudge, maple syrup and bananas is delicious and I also love how it has chewy, crunchy and soft textures that make it really fun to eat! 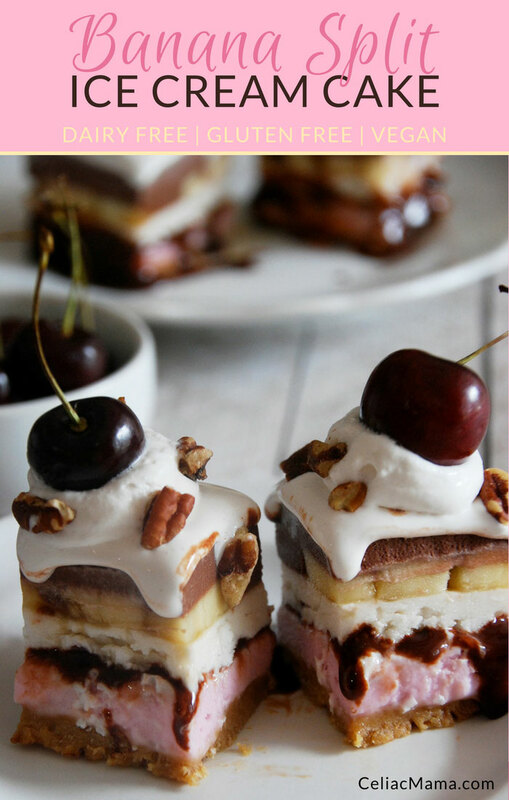 I know you’re going to love my modern, allergy friendly twist on the classic Banana Split in a dairy free ice cream cake, so you’ve just got to make some too! The recipe has a bunch of steps, but it’s really simple to make. There’s waiting time in between most of them so you can get other things done or play with your kids in between steps. Plus, even though it may have a 30 minute break in the freezer, you can leave it in longer if you have places to go. The time limits are just the minimums. Here are the recipe specifics, and don’t forget that there is a printable version at the bottom of the post if you’d find it easier to have a handheld copy. This recipe is dairy free, gluten free, egg free and vegan. Take out an 8x8 inch square pan and cover the bottom and sides with plastic wrap. This will keep the ice cream cake from sticking to the pan later. Remove 1 pint of Strawberry So Delicious Coconutmilk Ice Cream from the freezer and set it on the counter to thaw. Meanwhile, blend the graham cracker cookies in a food processor until they're finely ground. Place them in a bowl and add 1 tbsp of maple syrup, and mix together with your hands until it's evenly coated. The idea here is to make the cookie crumbs be just sticky enough to bind together. Layer the cookie crumbs on the bottom of your 8x8 pan to make a cookie crust bottom and place in the freezer for 10 minutes. While this is not traditionally part of Banana Splits, it helps give the ice cream cake a solid bottom which makes it hold up better when served. Remove the contents of the pint of ice cream into a medium sized mixing bowl. The ice cream should be softer, but not melted. Mix the ice cream until smooth. I use a hand mixer for this, but a stand mixer would work too. Remove the pan from the freezer and pour the smooth strawberry ice cream on top of the graham cracker cookie crust. Use a spatula to spread it evenly across the top. Place the pan back in the freezer for 30 minutes. Remove the pan from the freezer and add the chocolate syrup, spreading it with a knife or frosting spatula to make it even. Place the pan back in the freezer for 15 minutes, and take out the Vanilla Bean So Delicious Coconutmilk Ice Cream to thaw. After 10 minutes, check the ice cream to make sure it's thawed to the point of being soft (but not melted), waiting an extra 5 minutes if you think it needs more time. Remove the contents of the pint of ice cream into a medium sized mixing bowl. Mix the ice cream until smooth. Remove the pan from the freezer and pour the smooth vanilla bean ice cream on top of the fudge layer. Use a spatula to spread it evenly across the top. The key here is to spread it softly so that it doesn't mix with the fudge layer too much. After 25 minutes, cut your banana lengthwise and then chop it into 1/4 inch slices. Measure out the 1/4 maple syrup and set aside. Remove the pan from the freezer and arrange the bananas across the top layer so that they're pretty close together, but not quite touching. Pour the maple syrup in between the bananas so that it creates an even layer. It's ok if the maple syrup doesn't go to the top of the bananas, you just don't want to leave spots in between the bananas that don't have any maple syrup. Remove the Chocolate So Delicious Coconutmilk Ice Cream to thaw for 15 minutes, checking after 10 minutes to make sure it's soft but not melted. Transfer to a medium mixing bowl and blend until smooth. Remove the pan from the freezer and add the chocolate layer on top of the bananas/maple syrup layer, and use a spatula to spread it evenly. Place back in the freezer for 30 minutes. Remove the So Delicious Coco Whip from the freezer and scoop out half of the package (1/2 cup) into a medium mixing bowl. Let the CocoWhip thaw for 5 minutes and then mix until smooth. This will be much more liquid-like than the ice cream layers have been, and that's what you want. Remove the pan from the freezer and pour the Coco Whip layer on top. It won't need spreading, as it should evenly spread itself. Place back in the freezer for 1 hour or until you're ready to serve it. When it's time to serve, remove the cake from the pan by pulling up on the plastic wrap, and transfer it to a plate. 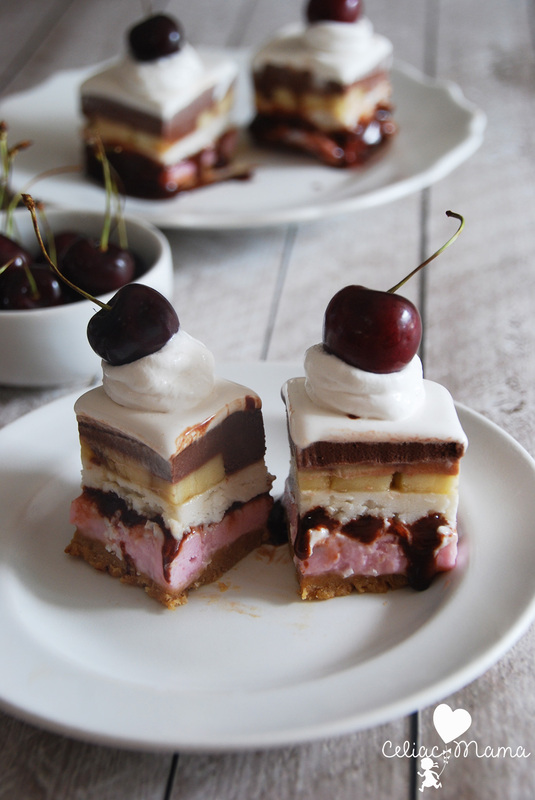 Cut slices and top with a splash of Coco Whip and place the cherry on top. If you like nuts, then I suggest adding a few crumbled pecans to the top.